Most of the signs we manufacture are made from cast aluminium which is then painted in UV resistant paints, providing a high quality finish which will last for years. These signs were produced for Steel Vintage - a company who specialise in handmade, industrial furniture right here in the UK. They wanted signs which reflect the hard-wearing and industrial aesthetic of their products - something shiny aluminium signs would not have achieved, even if left un-finished. Cast iron has a pleasing texture and finish - if you like your metals 'natural', which varies a from sign to sign. 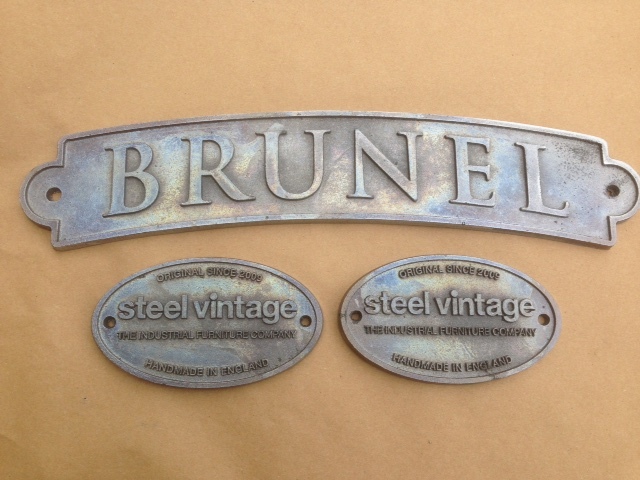 As you can see in the photo, cast iron signs are generally grey, but they have hints of other colours visible, which vary in size and position based on the rate of cooling and so on during the manufacturing process. The patterns for these signs were created in-house using our specialist CNC milling machine. The CNC machine is able to cut out exact replicas of the intended sign design in sheet acrylic, which are then used to create the moulds within the casting sand blocks. The level of precision we are able to achieve because of this technology and the fine casting sand we use to create the moulds ensures even the small lettering on the oval signs shown above is clear and consistent, with no missing details. If you're planning a signage project you may wish to talk to us before you start considering your design. There are so many options - not just in shape and form, but in material and finish too. If you're considering a brightly coloured painted sign, you might want to pause and think about something a little different. Signs like these make a real impact.